The track at Tamworth is now under the Daytona Motorsport umbrella so you can expect a top-notch service with some excellent karts and facilities. 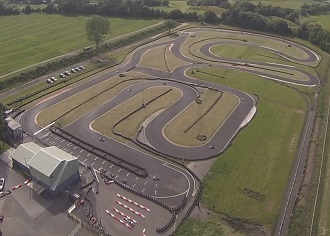 The circuit has also been extended to 1000 metres and can now accommodate up to 30 karts thus making it an ideal venue for large corporate events. Head south on Mill Lane toward Saxon Mill Lane and at the roundabout take the first exit onto Bolebridge Street. Go through one roundabout and at the next roundabout take the second exit on to Ankerdrive. At the roundabout take the first exit on to Glascote Road/B5000 and go through six roundabouts then turn left onto Robey's Lane then turn left - Destination will be on the right. An adult-only 'open' race event; 10-minutes practice followed by a non-stop 20-minute race. Please note that for exclusive events a minimum of 15 drivers is required. An adult-only race event; 10-minutes practice, 2 x 10-minute heats plus a 15-minute final. An adult-only 'open' race event; 10-minutes practice followed by a non-stop 40-minute race. Please note that for exclusive events a minimum of 15 drivers is required. A 60-minute team endurance event. Qualifying to determine your grid position then a non-stop 60-minute relay event for teams of 2 drivers sharing a kart. Exclusive use of the circuit for up to 6 cadets driving single-engine go-Karts - 1 x 20-minute session. For events where the you need something just that little bit different or completely non-standard just let us know your group size and requirements and we can advise on the best race format for your party.